OK so maybe Ronald McDonald himself won’t be there, but its always nice to see other companies jumping on goodness that we at Ninthlink picked up a month or two ago. 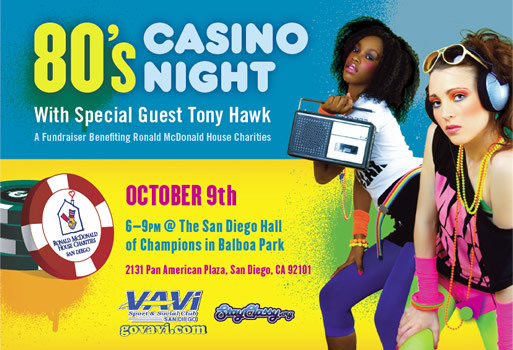 Still, what seems like a pretty swell idea, or at least, a neon-filled idea : let your 80s inner child come out and gamble with Tony Hawk and all sorts of members of the VAVI community and StayClassy.org, with proceeds going to the Ronald McDonald House Charities. The entry fee gets you Free Food and Unlimited Beer, there are prizes for Best 80s Costume & Hair, door prizes for the first 100 people, a silent auction, and additional winnings for the top 3 poker players. What more can you ask for? Check out http://www.rmhcsd.org/events.php for all the info! The word Gladiator is known world wide because of an epic movie. Well, if you loved the movie you are going to love this game. The 80s haunt me….I still have left-over Miami Vice style jackets. I’m going for sure! Who’s with me?